Kamuli — Government is in advanced stages of establishing a law that will pave way for the formation of an autonomous institution that will license, regulate and supervise non-Microfinance Deposit Taking Institutions (MDIs), an official has disclosed. State minister for Micro-Finance Caroline Okao said when passed, the Tier 4 Microfinance Institutions Act, will supervise microfinance institutions that are in the category of Tier 4 of which Saccos and Microfinance institutions MFIs are part. MFIs that are not MDIs are registered as companies and hold money-lending licences. 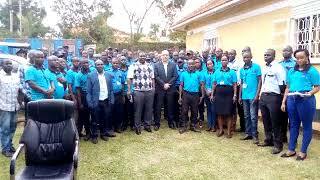 The minister was speaking af a function where the Microfinance Support Centre Ltd (MSC) handed over cheques worth Shs120m to village savings and loan associations in Kamuli District last week. During the function, Ms Okao said the law will promote social and economic development; ensure legitimacy and confidence building of members, customers and investors in the microfinance industry. "The law will enable the application of prudential standards to microfinance institutions in order to safeguard the depositors' funds," she said. During the same function, the minister also launched the new government strategy of Group Lending Programme for Community savings and credit groups where the MSC will directly provide financial services to community saving groups such as village savings and loan associations and nigiina groups. The minister said under the programme, government will conduct capacity assessment of the existing groups in Busoga sub-region, starting with Kamuli. She explained that the groups will be categorised according to their strengths so that strong ones get financial linkage while weak ones get additional financial training. "I would like to inform you that government has designed programmes that go beyond the SACCO methodology to support the self-help groups methodology among the communities," she added. MSC board chairperson Justine Bagyenda said they had developed a rural development strategy to enhance the deepening of microfinance with focus on access to wholesale funds, production and productivity, value addition and marketing, community information systems and rural finances. "Microfinance Support Centre is mandated to provide wholesale credit and strengthening management capacities of groups through provision of business development services and the law will help secure it," Ms Bagyenda said. She said the MSC group programme would make it easy for people at the grassroots that don't have collateral to access loans because members would act as security for each other. The Speaker of Parliament, who also the Kamuli Woman MP, Ms Rebecca Kadaga, challenged local leaders and community development officers to promote the saving culture among the populace and ensure it takes root for development. She also called for the revival of cooperative societies in Busoga which she said had led to the development of the region in 1980s.